Many Chinese cities are suffering from deteriorating environmental quality—particularly due to air pollution that contributes to fog and haze. Air pollutant levels now far exceed "safe" limits established by the European Union, and one of the main culprits behind it is the rapid increase in automobile ownership and usage. These rising environmental concerns are driving the development of new energy vehicles (NEVs)—aka plug-in electric vehicles—as a way to help mitigate the environmental problems associated with automobile usage. But sales of NEVs are still relatively low. In 2014, the 74,763 NEVs sold accounted for only 0.3 percent of total automobile sales in China that year. 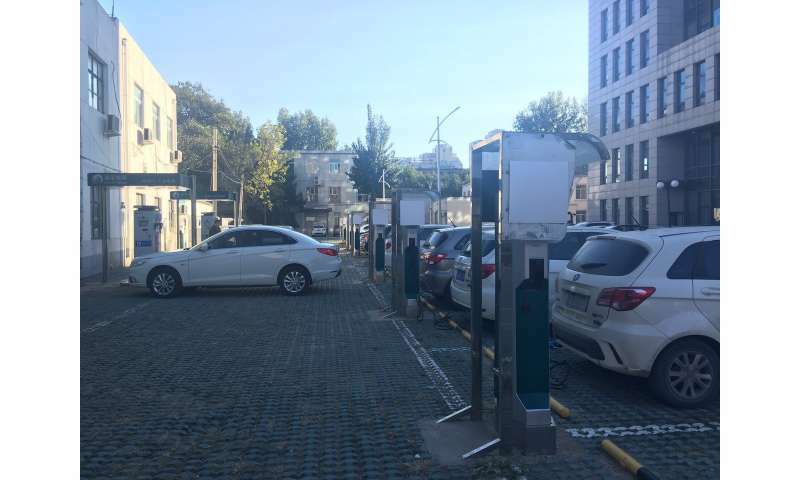 So, a group of researchers from the Center for Energy and Environmental Policy Research at Beijing Institute of Technology, the Collaborative Innovation Center of Electric Vehicles in Beijing, and the Sustainable Development Research Institute for Economy and Society of Beijing set out to find out what motivates or influences consumer to purchase electric vehicles within seven cities in China. They report their findings this week in the Journal of Renewable and Sustainable Energy. "China has a responsibility to make efforts to reduce the pollution for fossil consumption," said Yu Hao, an associate professor in the School of Management and Economics at Beijing Institute of Technology. The group's work is based on "a carefully designed questionnaire and an empirical analysis of its data to determine the main factors influencing NEV purchases," explained Hao. To aid and speed the development of China's NEV industry, "it's essential to understand both the motives behind consumers' purchases and any existing barriers to the popularization of NEVs," Hao continued. "Our studies revealed that monthly income, the number of cars a family owns, sustainability, and vehicle comfort are the factors that most strongly influence customers' purchasing behavior." They also found that factors such as age, marital status and city of residence are playing a role in consumers' decision-making process. Based on the group's findings, "several suggestions are now being provided to help develop the Chinese NEV market," Hao said. Their primary recommendation is that the Chinese government should consider scaling up "effective targeting of financial support and subsidies, while improving the financial incentive system for NEVs." Beyond that, "companies within the NEV industry should also be encouraged to increase their research and development investments," Hao added. "Ultimately, the government ought to encourage citizens to raise their awareness of the environment and sustainable development." As far as the next step for their work, "low carbon economy and NEVs are both hot topics around the world, so governments are competing to regulate subsidy policies for NEVs," Hao said. "We're interested in further exploring how these differentiated policies may affect consumers' purchase intentions so we can make corresponding policy recommendations." The government has the best chance to change the air quality there by replacing the ICE-driven transportation as it becomes practical. is certainly a good start. No nuke cars or coal burners. NEV actually refers to Neighborhood Electric Vehicles, such as golf carts and four wheeled mobility scooters that aren't allowed to go faster 25 mph. It's a bit confusing why the Chinese would be calling their electric cars "NEV", which would be an english acronym in a non-english speaking country. .....existing barriers to the popularization of NEVs," Hao continued. "Our studies revealed that monthly income, the number of cars a family owns, sustainability, and vehicle comfort are the factors that most strongly influence customers' purchasing behavior." ..........what the hell, this is a Communist country & they can't even do Communism right! Since when are ChiCom consumers permitted to have "purchasing behavior"? The ChiCom Gov't should simply mandate EVs & that would be the end of it! Huh? Geek? You're opposed to mandating "purchasing behavior"? What kind of a Command Economy aficionado for energy consumption are you? Well, at least we know where you live & can check what comes in & out of your driveway so we can monitor your day to day activities whenever we want, thanks for the transparency. Go Trump. Now that everyone knows that every utterance from him is a lie, the Pathological Liar is left with only himself to lie too. I forgot about his nuclear and coal-burning cars. His neighbors hate him.